Lavender has to be one of my favourite plants to grow and to use in my home. I have lavender essential oil which I use along with Castille soap to make my own face wash in soap pump. Lavender helps with stress and aids in sleep. When I was dealing with some sleeplessness I had a lavender sachet under my pillow. That sweet scent was heavenly and helped me relax and sleep. I also use lavender sachets in my t-shirt drawer and have one hanging in my closet. Every week I scrunch it up to release the oils that scent the air and my clothes. 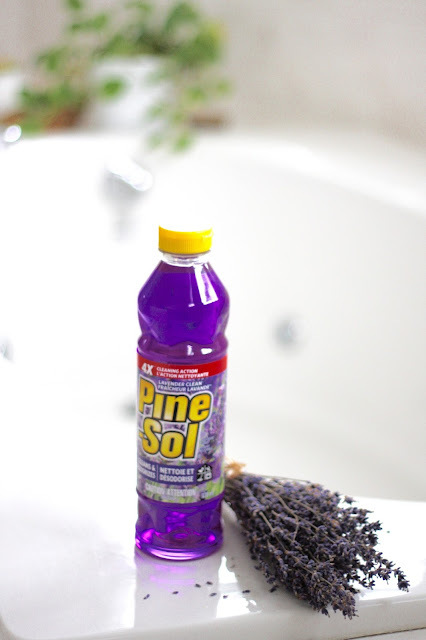 When Pinesol asked if I wanted to use their latest lavender Pinesol, I was intrigued. It has a nice scent while still has the disinfecting power of regular Pinesol but without that woodsy clinical smell the regular Pinesol has. I used it to clean our master bath, heaven forbid I show you photos of that sad space stuck in the early 90's, but my tub was sparkly clean! Now if only I have my kids back into the house, so I could pay them to clean the house for me!